Amount that every signed First Nation stands to profit PER YEAR under the Umbrella Final Agreement. Revenues to governments in taxes and royalties including revenue sharing opportunities for First Nation governments. Business opportunities for product and service supplier contracts, as well as through joint ventures and other partnerships during the construction and operation phases. Career development opportunities for skilled, trades, professional, and entrepreneurial businesses. Capacity support for community infrastructure, organizations and initiatives. 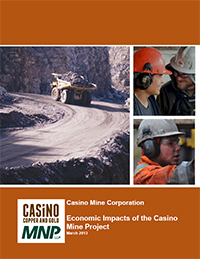 According to a 2013 Economic Impacts Report, Casino has the potential to generate substantial benefits for the Yukon economy. The total projected impacts of construction and operation to Yukon is $6.4 billion to its Gross Domestic Product (GDP), $1.8 billion in tax and royalty revenues, and approximately 600 full-time jobs annually during its proposed 22-years of operations. Total projected impacts are shown in the table below. For more information, please view the Economic sections of the project proposal and supplementary information. Copyright © 2019 Casino Mining Corporation, A Fully-Owned Subsidiary of Western Copper and Gold Corporation. 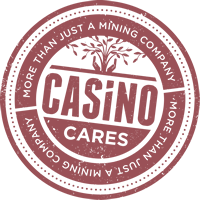 Stay connected with Casino Project developments by subscribing to our newsletter and e-mail updates.